"The Great Bespeak for Miss Snevellicci" (November 1838), an illustration for Nicholas Nickleby by "Phiz"
Source: J. A. Hammerton, The Dickens Picture-Book, p. 157. In Ch. 24, "Of the Great Bespeak for Miss Snevellicci, and the first Appearance of Nicholas upon any Stage" (Part 8, November 1838), Nicholas (under the alias "Mr. Johnson"), Miss Snevellicci (the subject of the "bespeak" or benefit performance), and the Infant Phenomenon canvass Portsmouth for donations from wealthy patrons. 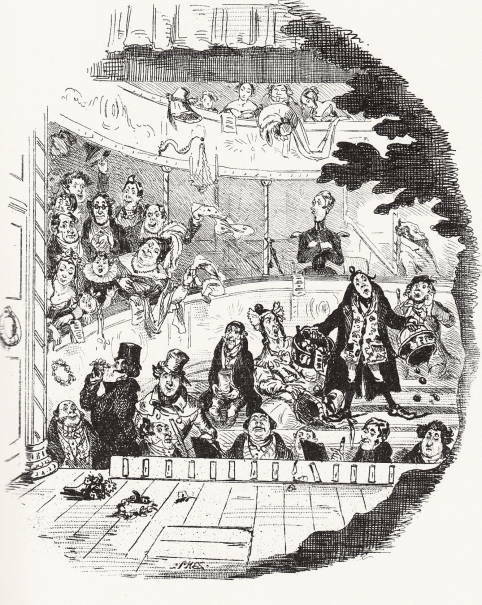 The opening night, despite the apparent chaos in the audience suggested in Phiz's illustration, is highly successful, at least commercially, thanks to the financial support of Mr. and Mrs. Borum, who attend the bespeak with their children Augustus, Charlotte, and Emma (left). Dickens once again satirizes both the early Victorian theatre and the artistic tastes of the rising middle class — the very class that is purchasing the monthly parts of his novels in such numbers.